"That’s how it’s always been done" is a phrase you will not hear uttered in the Department of Radiology and Radiological Science at The Johns Hopkins Hospital or at Johns Hopkins Medical Imaging. Organizations often cite historical precedent for why “option A” is being implemented instead of trying “option B.” The radiology department has seen the value of mixing things up to improve processes that ultimately save time and money, and improve the patient experience. The department of radiology’s Quality Improvement (QI) Committee is a diverse team with representation from radiology divisions, clinical and nonclinical roles, and department leadership who look at process improvement holistically. Active and growing since 2009, their mission is to continuously build and develop a culture of quality and safety by empowering our front-line teams with the tools, resources and support necessary to create positive, meaningful change. 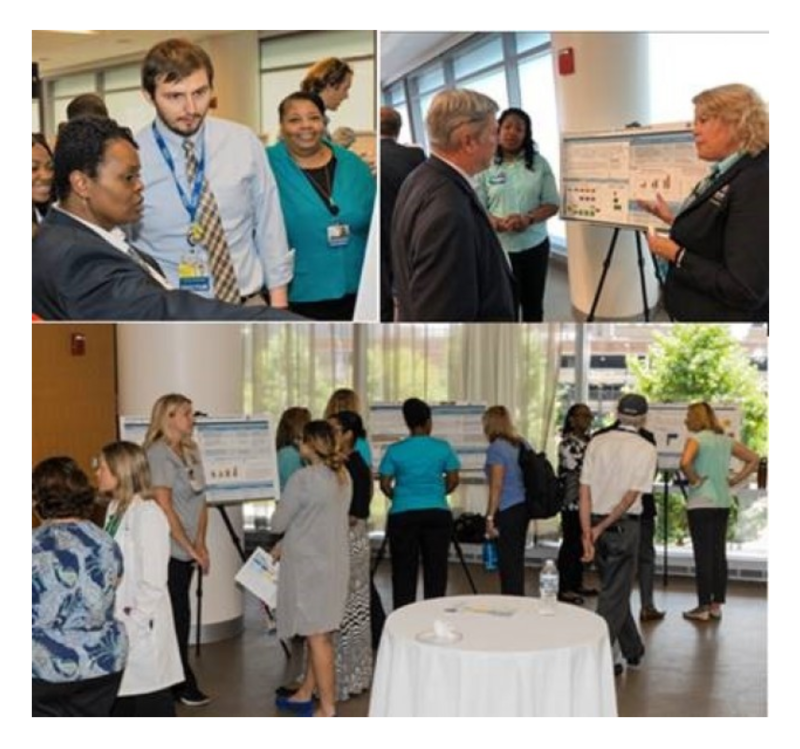 Due to the QI committee’s growth and the widespread interest in their work, this year’s improvement projects were showcased in an interactive poster session held at the Chevy Chase Bank Auditorium. Upwards of 200 people participated in learning about these projects from inception to implementation and how they will be applied moving forward. The QI committee team members executed 15 improvement projects around reducing waste in health care delivery, eliminating preventable harm and optimizing patient outcomes and experiences. A few examples are reducing waste of CT contrast media, decreasing inpatient MRI bottlenecks through collaboration with transportation and lessening MRI scheduling errors. Combined, these projects created an estimated savings for FY19 totaling $363,631. Each improvement project had an A3 poster that defined the problem being addressed and the key metric and interventions undertaken to achieve the stated goal. The beauty of the poster presentation was its ability to provide front-line staff the opportunity to hold in-depth conversations with department team members who they do not interact with in their day-to-day work. Marty Bledsoe, former Johns Hopkins Radiology administrator and current president of Johns Hopkins Medical Imaging, has watched the QI program mature, realizing that many of the QI projects were projects that he himself wanted to implement but lacked the time to manage. The talent and dedication of Radiology’s front-line staff has made these projects a possibility and success. Committee Chair Vince Blasko participated in the Armstrong Institute Lean Sigma and Leadership Academy training and used his learnings to shape the QI program. The QI committee practices Lean Sigma’s process tools such as A3 problem-solving to address chronic operational problems. The QI committee’s formula for success is composed of three key components: leadership buy-in + employee passion + education and mentoring. A successful improvement project starts at the top with leadership’s support of the time and effort needed. Improvement project ideas are developed from team suggestions, applied and led with the full support of department managers and supervisors. Richard Hill, assistant director of Lean Sigma deployment at the Armstrong Institute, stresses the importance of leadership support during this process. The Lean Sigma programs are not just a two- or five-day course. Leadership must be willing to support their staff in being out of the office for the training to learn the lean tools and techniques, as well as the time necessary to continue their improvement project to completion. Peg Cooper was instrumental in providing this level of support and leadership. Motivation can’t only come from the top. You need “boots on the ground.” Employee engagement and a passion for problem-solving and process improvement are critical to seeing a project to completion. To ensure a project is successful and sustainable, team members need training and mentorship from beginning to end. Project team members are mentored on how to create projects within Lean Sigma’s DMAIC (define, measure, analyze, improve, control) methodology. The QI program continues to grow, with an estimated 50 team members joining monthly meetings that involve guest speakers and project updates. Seventy percent of those involved in the QI committee are on-the-ground team members, including roles such as scheduling, front desk reception and technologists. QI members commit to a two-year term, with their first year learning the program and their second year mentoring a new member. This mentorship helps projects move forward with very little transition time wasted. The QI program is a valuable asset within the department of radiology. The committee motivates and empowers staff, and improves patient experiences and outcomes while eliminating waste and saving money. For those who are interested in creating significant improvements in their own departments, Vince Blasko, advises "the key to our success is really driven from engaging, empowering, and supporting our front line clinical teams. This approach has helped us to create and sustain a culture of continuous improvement throughout the Radiology Department".